You receive a call right before said encounter, and are informed that your coffee companion is already headed down the highway, and you are asked “where do you want to do this?” Not being accustomed to being rushed and having a set plan, you state that you need to go home and get ready, but you inquire again where this individual would like to meet. You are told, with a twinge of annoyance, that this person does not know where anything is, and has no idea where to go, and Starbucks is mentioned again. How you could not be excited about this date is beyond me. 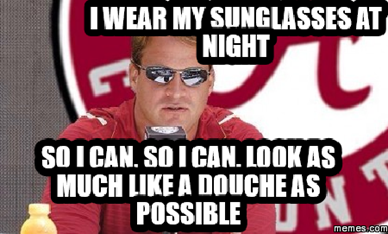 You then engage in a discussion about sunglasses at night, or rather, sunglasses indoors. You base your argument on the concept of respect, and that you believe that lack of eye contact can be considered rude. The other individual doesn’t care what you think, and says they like to be able look anywhere they want, and not be bothered with engaging in social interaction. This is a clear red flag, but since you are determined to have the worst love life in the history of everything and you figure this will be a great story to tell, you keep going and remain somewhat positive. These happy thoughts are once again shot down, and your date begins to complain about an awful concept that is sweeping the nation with despair and crippling the economy: valet parking. What follows is a diatribe about the city of Miami being flush with valet opportunities and a lack of self-park options. Even though you try to interject with a point about city growth and retail/real estate opportunities, your date continues on about not wanting to throw money out the window, and where he’s from, valet is not an epidemic. You inquire as to how a metropolis such as Atlanta does not offer valet, and you are told it’s an option only on the club scene. You are also told that this will be one of the last times they will visit Miami, as their residence of Hollywood, FL is more of a serene atmosphere, with a plethora of parking. You no longer need to ponder if there will be a second date, due to this recent statement. Your date then contradicts themselves once again, as they creepily give you the “up-down” stare and proceed to comment on how “juicy” you look. You are skeptical when it comes to the meaning of this statement, but do not ask for further clarification. Your date then asks if you would like to give them a reason to come back to Miami and valet their car at your building. You think back to earlier in the week, when your date balked at the thought of valet at your apartment (the exact phrase was “I gotta pay to come see you?”). What you first thought was a joke is clearly a legitimate concern of his, and you realize he is serious. When you reconsider their offer to sacrifice $5 in hopes that they may get lucky, you just give them your best “Chandler Bing engagement photo” smile and sip the rest of your drink. You also realize in that moment that you should have ordered iced coffee, as you were forced to sit outside and your hair has now transformed from Beyonce to James Brown. Fortunately, your date doesn’t seem to notice, as they have been dodging eye contact (with the glasses off) and looking around the entire 25 minutes you’ve been there. Up to this point, your date has not asked you one personal question, and it’s clear that he doesn’t plan on it. You make a final attempt at normalcy, and begin a discussion about concerts, one of your favorite hobbies. An engaging discussion ensues, and you think “Hey, this is the guy I was talking to earlier this week!”, and are hopeful that you can at least salvage this outing as a positive encounter. But when your date asks you why you would go see Janet Jackson again in concert because “she old as hell”, you know enough is enough. A person can be rude and cheap, but they simply CANNOT disrespect Ms. Jackson, because now you have to get nasty. After you go on to say that seeing Prince in concert was amazing, your date then questions why all women are attracted to Prince, because “he looks like a little woman”, and also points out that he is barely taller than you. Clearly this individual was raised by wolves, because he continues to disrespect the greatest music entities of all time. After clarifying that Prince is 5’2”, you explain that the Purple One is not to be understood, he just IS, and no one can really explain their attraction to him. Your date then asks if you are attracted to them, and they see your hesitation. Now that is 100% clear that THIS will not be happening again, your date suggest that you call your Uber, gives you the worst half-hug in the history of awkwardness, and walks away. You feel a bit bummed out that the date didn’t go well, and wonder why these awful things keep happening to you. This empty feeling quickly dissipates when your Uber driver arrives in less than 2 minutes, in a pimped out Town and Country, and you hop in through the self-opening door like a boss. Granted, you realize that you selected UberXL in error, and your ride ends up being more expensive than it should be. But it’s worth every penny as you roll past your date who’s still standing there, waiting for the valet. So you sat there trying to convince him to take off the sunglasses among other things? I’ve had a date that seemed they weren’t interested and I ended the meet and greet early.